An idyllic seaside vacation begins at Raya Beachloft. The villa places vacationers in a superb beachfront location (panoramic sea views guaranteed), has well-appointed living areas and boasts multiple outdoor spaces. The ambience is intimate and cosy, and with two bedrooms within the property, Raya Beachloft is just right for a small group getaway with close friends and family. The first bedroom is located on the ground floor, and comes equipped with a king bed,ample wardrobe space, satellite TV and en suite bathroom. The master bedroom, set on the upper level also features a king bed, wardrobes and satellite TV - yet stands out with amenities such as a generously proportioned bathroom with twin vanities, bathtub and shower alcove. 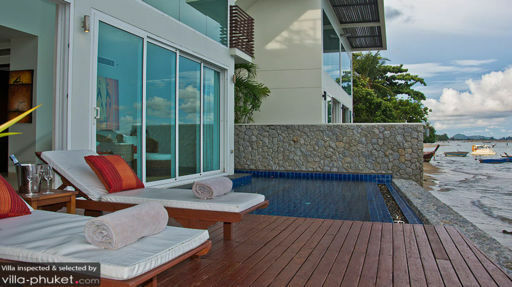 It also offers panoramic views out to the sea and offshore islands. Push back the glass sliding doors of the living area to reveal the sun-soaked outdoor deck at Raya Beachloft. There’s a turquoise pool with views out to the ocean, framed by a wooden deck with sunbeds and a four-seater dining set. But that’s not the only outdoor space to kick back and relax. 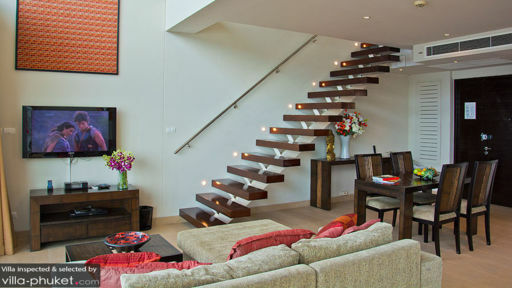 Ascend up the stairs, and you’ll find yourself on the villa’s spacious rooftop terrace. Kitted out with recliners, sun umbrellas and a dining set, it’s the perfect lounging spot for all occasions - from sunbathing sessions, to sunset cocktail parties and alfresco dinners. The main living area boasts an open plan layout, with a lounge that extends out seamlessly to include a dining area and kitchen. It’s furnished with a TV with DVD player, plush sofas, a dining table that comfortably accommodates six and a fully equipped kitchen. Modern furnishings, colourful artworks and expansive floor-to-ceiling glass sliding doors create a sunlit interior that feels airy and inviting. Airport transfers, bicycles, gym equipment, welcome drinks, housekeeping service, laundry service, personal guest service and security service are included with your stay. Amenities available at additional cost include in-villa massages, daily breakfast service, personal chef service, personal driver service as well as car, boat and scooter rental. A baby cot will be provided at request, while child minding services are available at extra cost. 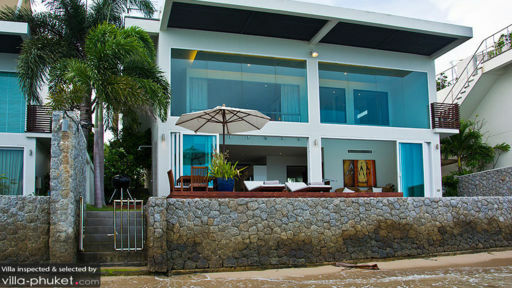 Raya Beachloft is located in Rawai, a seafront village in South Phuket. The atmosphere is lively without being busy, and the area is less touristy relative to the nearby beaches of Kata and Patong. It’s a great option for villa vacationers looking to stay in an area that offers peace and serenity, yet is within easy reach to the restaurants, local amenities and lifestyle attractions. There are myriad attractions close by to explore - from the beaches and offshore islands, to viewpoints offering spectacular vistas and beautifully preserved streets steeped in history. You’ll have endless options to fill up your days with - plan a day trip to the picture-perfect Coral Island, take a drive up to the summit of Promthep Cape, join in a tour of the Chalong Bay Rum Distillery, discover the bohemian art enclave of Phuket Art Village or explore the streets of Phuket Old Town. The dining scene here is just as wide-ranging; there are healthy cafes, beachfront venues, popular seafood haunts and fine dining restaurants to choose from. Our list of recommended venues goes on endlessly, but here’s a select few you can start with. Check out Coffee Tribe for its hearty breakfast sets, Kan [email protected] Restaurant for its waterfront setting and seafood dishes, Rossovivo for Italian fare, We Café for its wholesome salads and wraps and Wok Pagoda for its innovative Thai-Western fusion food. I highly recommend this listing. It was clean and very comfortable. The host arranged our pickup from the airport, which made our arrival smoother. You can watch the sunrise from bed. This is an amazing way to wakeup after a night of much fun. My sister and I had an amazing stay. The condo was prefect, very spacious and the views were even better. We were able to watch the sunset some several areas in the house. We walked to a nearby market for a taste of Thai culture. There is a 7/11 across the street, and some food vendors a long the main road. Jenny, the property was so helpful! She was able to book tours and arrange transportation for us. Any questions we had, we were able to reach her by phone any time of the day. I wouldn't be hesitate about booking this place..JUST DO IT! I stayed 3 nights at Raya villa, the villa is spacious, beautiful, new and well maintained, location was awesome with amazing views, specially sunrise and views during the high tide. There is a small stretch of private beach, right In front of the villa idea good for a stroll but sea is not the best for swimming however good for canoeing. There are massage centers and a convenience store near by, however recommend to keep a car, if one wants to enjoy the rawai surroundings Debbie was highly responsive to my questions and requests and Jenny was very helpful on the ground. Overall Excellent experience. The closest you can get to nature and still feel at home.